Machinima is the technique of using real-time 3D technologies such as computer games or virtual worlds in the creation of animated video productions. The Second Life virtual world provides an open landscape where inexpensive virtual movie sets, props, costumes, and characters may be created to meet specialized educational purposes. Interactive video techniques used to create online video simulations, virtual tours, adventure games, or interactive tutorials can be coupled with machinima to create interactive educational machinima products. YouTube supports this technique by providing both video hosting and the Annotations tool, which enables linking from video to video. Usage and demographic data may be collected on YouTube automatically to identify patterns of use. 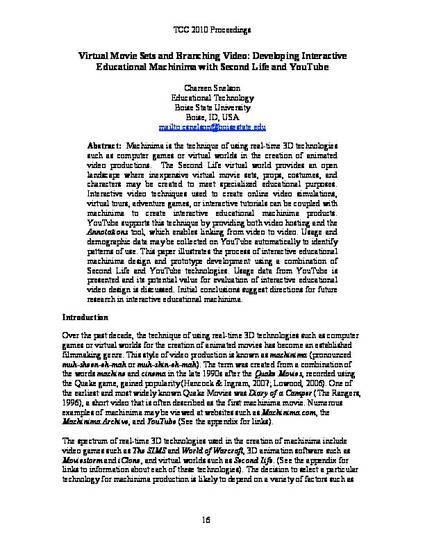 This paper illustrates the process of interactive educational machinima design and prototype development using a combination of Second Life and YouTube technologies. Usage data from YouTube is presented and its potential value for evaluation of interactive educational video design is discussed. Initial conclusions suggest directions for future research in interactive educational machinima.